The Oakland Raiders went into Kansas City looking to take the sold lead of the AFC West but quickly realized they’ll have to get some help if they plan on winning the division. The Chiefs outmuscled the Raiders from the beginning, forcing Derek Carr and the Raiders offense to struggle to get anything going. With the offense struggling, the Raiders defense was forced on the field for a majority of the time but played well in the first half. Following a first quarter field goal, the Raiders gave up their lone first-half touchdown when rookie running back Kareem Hunt got over the goal line up the middle, giving the Chiefs the early 10-0 lead. The Chiefs would tack on two more field goals to give the Chiefs a 16-0 lead heading into the half. The Raiders defense continued to be put in tough positions in the second half. Back up against the ropes, it was second-year player Karl Joseph that came up with the big play intercepting Alex Smith to give the ball back to Carr. But the Raiders offense couldn’t do anything with it once again, going three-and-out and punting the ball back to Smith. With a short field, it took the Chiefs offense just four plays to go 38 yards, including a 13-yard run by Charcandrick West to extend their lead to 26-0. 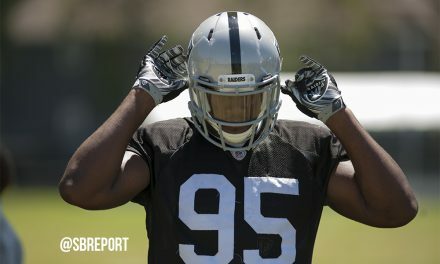 The Raiders got a much-needed spark when former third-round pick Shilique Calhoun bursted through the line on fourth down and blocked a punt attempt, giving Carr a short field in the fourth quarter. After going away from the run, offensive coordinator Todd Downing went back to his veteran Marhshawn Lynch. Beast Mode went untouched while scampering 22 yards up the middle of the field for the Raiders first score of the day. Still down 19 and in the final quarter, kicker Giorgio Tavecchio executed the perfect onside kick to give the ball back to the Raiders. Carr threw his nicest pass of the day on 4th and 7 with pressure in his face, laying it in nicely to tight end Jared Cook for a 29-yard touchdown pass. Carr would find Michael Crabtree for the two-point conversion to make it just a two-score game at 25-16. Head coach Jack Del Rio elected to trust his defense instead of attempting another onside kick, a move that ultimately cost the Raiders precious time. Still down 11 points and nearing the two-minute warning, the Raiders took their time going down the field instead of taking shots downfield. Carr and the offense finally threw it deep with less than a minute left, only to have the ball bounce off receiver Johnny Holton’s hands and into a defenders to secure the Chiefs win. The Raiders finished with just 268 yards of offense, opposed to the Chiefs 408. 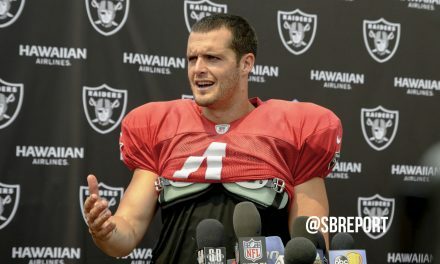 Carr finished just 24/41 for 211 yards, much of which came in the final quarter. The loss puts the Raiders on the outside of the playoffs again as the Chiefs now have control of the AFC West once again. Del Rio and his team will return home to take on the Dallas Cowboys next week.